The TRCA (Toronto and Region Conservation Authority) and ecoCaledon organized the First Annual Rain Barrel Artist’s Collection. Local artists were invited to” Paint a Picture for Water Conservation”. 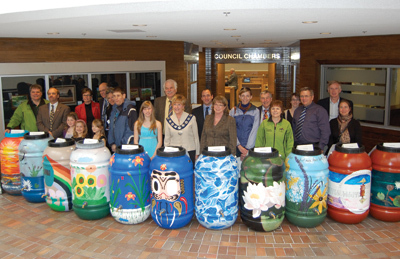 Over 11 artists submitted designs to paint an ecoCaledon Rain Barrel. Each artist used their own unique design to beautify the Rain Barrel. The Rain Barrel Artist’s Collection was displayed at various locations within the Caledon community from May 28th – June 30, 2011. Participating locations included: Berney’s Pro Hardware, Trailside Café, Foodland Plaza , Caledon Town Hall, Davis Feed, Albion Bolton Library, Zehrs Bolton, Home Depot Bolton, Canadian Tire Bolton, Glen Echo Nursery and various TRCA and ecoCaledon participating event locations. We are hoping to make this an annual event to raise awareness for and excitement around water conservation, and couldn’t have asked for a better group to work within our first year. 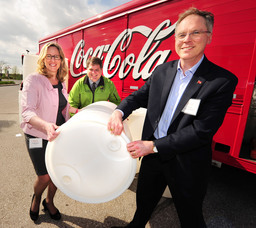 Coca-Cola donated 100 white beverage concentrate barrels to be converted into Rain Barrels. This could be a long term program and will allow for higher profits to finance our environmental programs. Jim Cassell, Donna Ferron, the Ontario Minister of the Environment, John Wilkinson, Sandra Banks, Director of Communications Coca-Cola and several other members of both organizations toured the Coca-Cola Brampton bottling plant at the media launch on May 19th, 2011. ecoCaledon received terrific media coverage from Brampton Guardian, Caledon Enterprise, CNW, Worldclick.com and many other online media sites. The Climate Change Program is a two year program funded by the Town of Caledon Green Fund program. It is designed to include a few elementary schools and one high school, and to assist the schools that are struggling to achieve their EcoSchool Certification. In the 2011-2012 School year ecoCaledon launched a school program dealing with issues of climate change. As the first stage of the program we engaged with a grade 11 environmental science class at St. Michaels Secondary school. Over the course of 5 weeks the class received 5 visits from ecoCaledon during which time they worked on projects and activities related to climate change. Activities included; conducting an assessment of individual carbon footprints, using Kill a Watt meters to locate energy waste and phantom loads in their own home, establishing personal goals to reduce personal impacts, developing an action plan to conduct an anti-idling campaign in their school for the 2012-2013 school year, coming up with creative campaigns and promotional tools to spread messages in the school and surrounding community, examining the role of food and its effects on the environment, engaging in a work bee at a local community garden, exploring and discussing many views and potential solutions to climate change.